I was challenged by Daniel Knudsen (who directed me in Creed of Gold, Rather to Be Chosen and Lifestone Velocity) to pray seven nights for our nation on Facebook. I've been praying the Armor of God (Ephesians 6:10-18) over America, one piece a night. This morning during our service at Westchester Chapel I prayed on the Shield of Faith. In the service which followed, Dr. Linda Warren preached on Matthew 9:14-17. I showed a video of children passionately worshipping Jesus in Indonesia, the nation with the highest Muslim population. Joyce gave the announcements and mentioned the lightning video we posted on July 17. 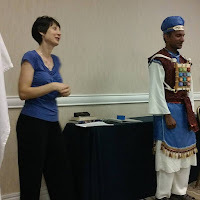 Before the service, in our Bible study, our series on the garments of the high priest, as described in Exodus, concluded with the putting on of the garments! They're a beautiful picture of the Lord's plan for Salvation in Jesus Christ becoming our High Priest. You can download a handy prayer guide by clicking here. I play a lead in Providence, which you can bring to your area. I opened our service at Westchester Chapel this morning with Psalm 34:1-3 and prayer. 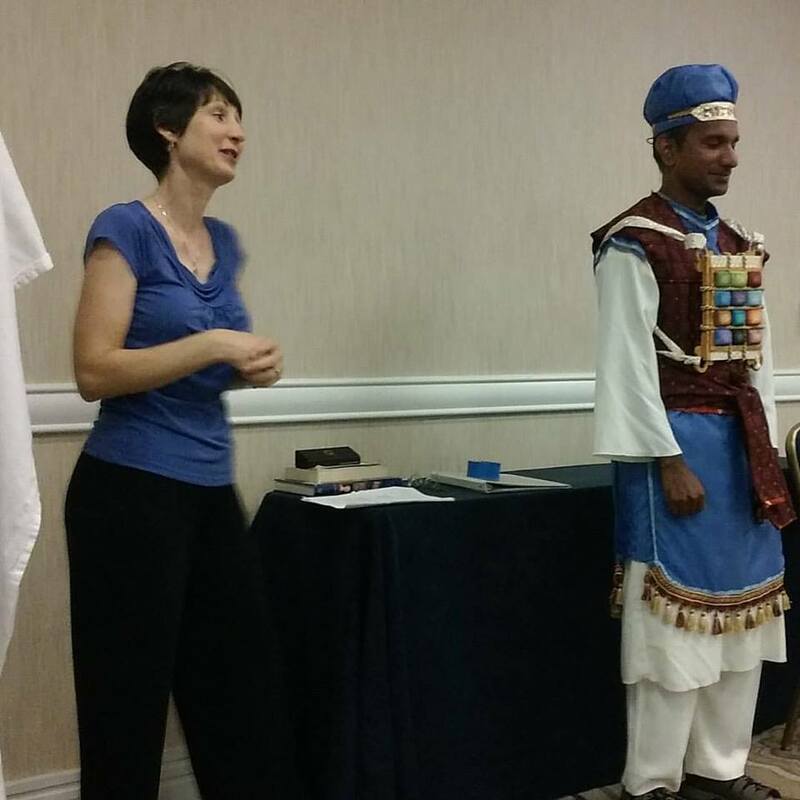 I also introduced Kara M., who spoke on her ministry in India. Pastor Jim Warren preaches on Matthew 8:1-9:13. Andrew and Natasha K. shared about their ministry opportunities in the three years since they moved away to Tulsa. Pastor Linda Warren prays over the sermon and brings the announcements. with the Lord and his people. 'Jesus' - Powerful New Song from Chris Tomlin from chris-tomlin on GodTube. Joyce and I just got to see an advance screening of Hillsong - Let Hope Rise, a film about the Australian band Hillsong United, that is as much worship service as it is documentary. It follows the four months before the band's grandest engagement to date, at the Los Angeles Forum. Members push themselves to write a whole new album (Empires), and some of the songs are being finished within an hour of the concert. There's one moment where Joel Houston, son of the lead pastors of Hillsong Church in Sydney, says there's a spark from the Lord, but then He expects us to do some work to finish the assignment. That really resonated with me as a performing artist, currently working on a project. 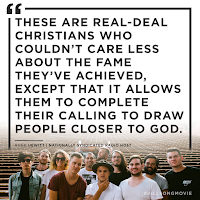 Another point of connection is that the band members rely on their pastors to greenlight their lyrics, making certain that everything is in alignment with the Word of God. 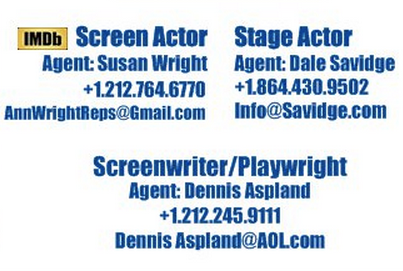 I've always submitted my plays to that process as well. The band was formed when members were still in the Hillsong youth group. They've now toured all over the world. 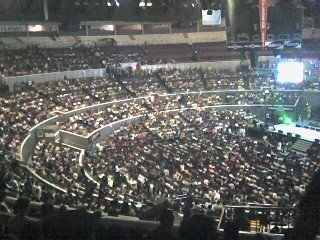 One of the venues was a stadium in Manila, where I was a part of a church service on the heels of the Beijing Olympics. At one point they show clips of people worshiping to their hit "Mighty to Save" from all over the planet in various languages, including sign language. They estimate 50 million people worship the Lord to their songs on a weekly basis. Another moment that struck me was when one of the artists said something about band members wanting to do their best so that people could focus on them just long enough to be directed to the Lord. Beautiful! That's certainly been my heart for the work the Lord's given me for 21 years. 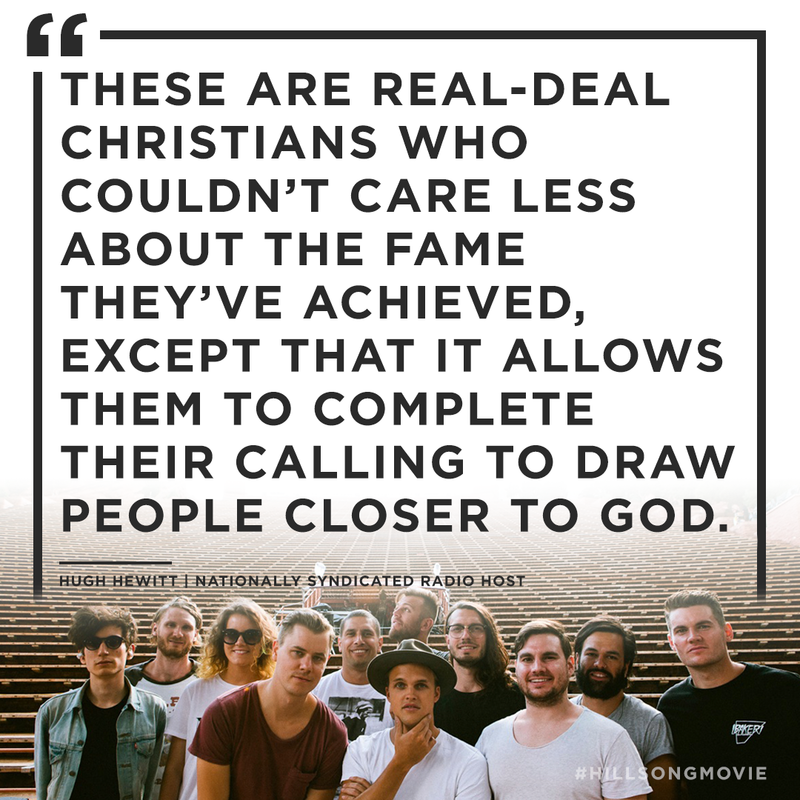 Though Hillsong United performs for tens of thousands at each concert, members point out that they're all on ministry salaries and are purposeful about staying connected to the needs of those who come to their concerts. 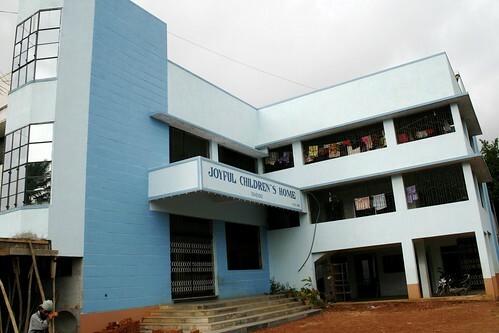 As a Compassion artist I was overjoyed to see that the band and church have helped 40,000 children find sponsors! Some of their visits with children were reminiscent of trips Joyce and I have taken to see the great work Compassion is doing around the world. My favorite part of the Hillsong -- Let Hope Rise experience is that the producers included the lyrics to the songs the band is singing, inviting the movie audience into worship. I was moved on many levels. The movie experience opens in theatres nationwide September 16. Take advantage of this amazing opportunity to invite someone who needs Hope to a theatre. This year at the Rocky Mountain Christian Filmmakers Camp we produced a short film, "Felicia's Pledge," which follows another character from the novel In His Steps. 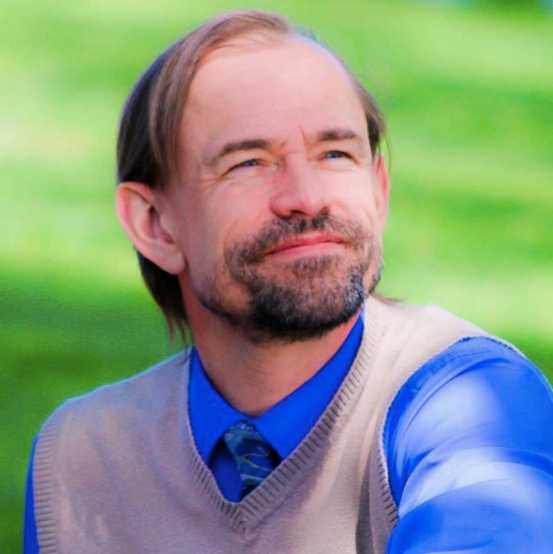 I got to reprise my role of John Gray and Ken Lawrence, the director of Film Camp, reprised his role as Pastor Henry Maxwell from the film In His Steps. The rest of the roles were played by our students. 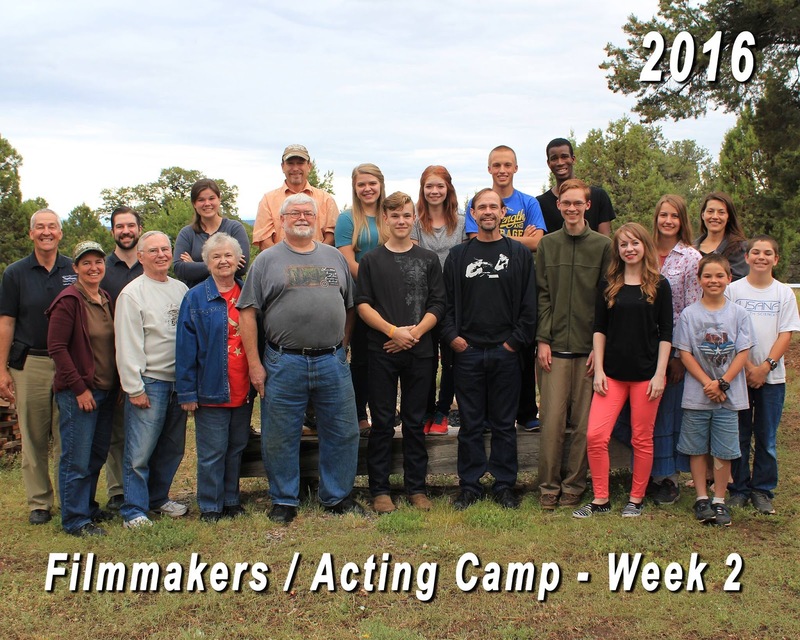 Our acting students who had been film students in the past helped film the monologue. I've been mentioned again in the George Fox Journal, the alumni magazine for my alma mater. This one, on page 27, mentions my role in Providence. The last mention was an article on my career: "A Class Act."